Danish thrash veterans ARTILLERY are back with The Face of Fear — their ninth full-length disc — featuring nine new tracks (one of which is an instrumental) and rerecorded versions of two of their classic songs. The current lineup of Michael Bastholm Dahl (vocals), brothers Michael Stützer (guitar) and Morten Stützer (guitar), Peter Thorslund (bass) and Josua Madsen (drums) also appeared on Penalty by Perception (2016) and Legions (2013). On the surface, The Face of Fear successfully continues in the melodic thrash vein established with their previous two releases. A closer listen, however, reveals some fine points that help to put ARTILLERY in the upper echelons of their chosen style. First, they are early progenitors of the thrash genre, and the creative core of the Stützer brothers brings a credibility and authenticity to the music — adding a certain depth that is otherwise hard to replicate. Second, the songs are all well-written, arranged and produced. This goes a long way in today's crowded marketplace; anything less tends to get lost in a sea of new releases. Third — and this is a major point — Michael Bastholm Dahl's power metal approach has enough grit and authority to sit well in the mix, highlight the memorable melodies and stand up to the vicious riffing (similar to, for example, ANTHRAX and HEATHEN). The result is the potential appeal to a broader array of traditional and classic heavy metal fans who might struggle with more "rough around the edges" thrash front men. The guitar work, songwriting, performances and modern production (punchy and crisp) are excellent. The clean electric and acoustic guitars, soundscapes and other aural details provide enough texture to temper the full-on metal assault — including a tried-and-tested frantic lead style that comes right out of thrash's glory days. 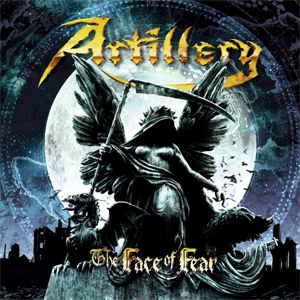 The official videos for "The Face of Fear" and "Pain" and the official audio track for "Crossroads To Conspiracy" ably demonstrate what ARTILLERY delivers on The Face of Fear — top-notch melodic thrash.